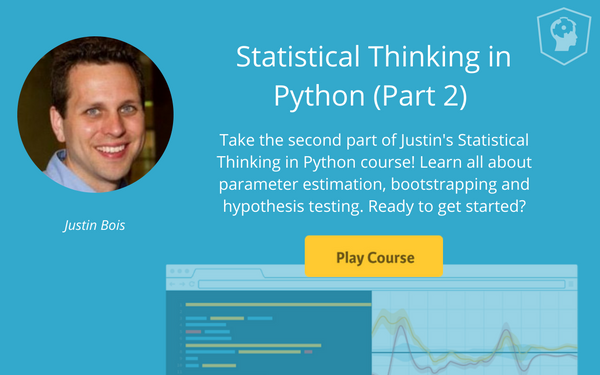 We just launched Statistical Thinking in Python (Part 2) taught by Justin Bois. After completing Statistical Thinking in Python (Part 1), you have the probabilistic mindset and foundational hacker stats skills to dive into data sets and extract useful information from them. In this course, you will do just that, expanding and honing your hacker stats toolbox to perform the two key tasks in statistical inference, parameter estimation, and hypothesis testing. You will work with real data sets as you learn, culminating with an analysis of measurements of the beaks of Darwin's famous finches. You will emerge this course with new knowledge and lots of practice under your belt, ready to attack your own inference problems out in the world. Statistical Thinking in Python (Part 2) features 68 interactive exercises that combine high-quality video, in-browser coding, and gamification for an engaging learning experience that will further sharpen your statistical thinking with Python skillset. The first chapter of this course addresses parameter estimation by optimization. You will learn how to find the optimal parameters or those that best describe your data. [Start First Chapter For Free] The second chapter of this course will introduce you to bootstrapping. In statistical inference, you want to know what would happen if you could repeat your data acquisition an infinite number of times. This task is impossible, but can we use only the data we actually have to get close to the same result as an infinitude of experiments? The answer is yes! The technique to do it is aptly called bootstrapping. This chapter will introduce you to this extraordinarily powerful tool. The third chapter of this course provides an introduction to hypothesis testing. After completing this chapter, you will be able to carefully construct and test hypotheses using hacker statistics. The next chapter dives deeper into hypothesis testing by walking you through a couple of examples to truly understand the concept. Lastly, you'll finish the course with a case study using data collected on Darwin's finches. Ready to get started?